There is a free public lecture (bookings necessary) at RMIT on Wednesday night. Enlightenment and Education: public lecture by Sir Harold Kroto. How can the internet help communicate science, make sense of scientific methodology and lead to more informed public debate? Hear Nobel Laureate Sir Harold Kroto on the crucial issues of science, education and the public sphere in a free public lecture as part of the RMIT Transforming the Future lecture series on Wednesday 28 September. Professor Kroto will discuss his views on the importance of scientific knowledge and education, and how both are vital to better informing public debate around issues such as climate change. The event is free but registrations are essential. School Holidays are here, and rather than hemorrhage money at the Royal Melbourne Show, there are many other events to take you’re little ones. For instance, I can heartily recommend It’s Not Circus, It’s Science, put on by the duo Barnard and Wild of Teacup Tumble Theatre. It’s circus meets science meets physical comedy and whips. Welcome ladies and gentlemen to today’s Inaugural Symposium of Distinguished Scientists. 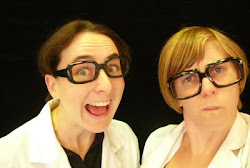 Professors Wild and Barnard are here to demonstrate some important scientific breakthroughs – if only Professor Wild would stop tampering with the equipment and making friends with the audience. It’s Not Circus It’s Science is a 40 minute show complete with acrobatics, clowning, neuroscience and physics. Audiences gasp, yell and laugh uproariously as these ridiculous scientists fumble their way through their presentation. Adults love it, children love it, scientists wish they were it; this is circus for the elite minds of the 21st Century! Last Sunday saw the first Think Inc. conference in Melbourne. Thanks to my awesome manager I was able to score a place in the crowd. Here’s a few notes on each of the presenters, hastily put together from my jottings on the day. I’m putting this here without much thought or analysis for friends and interested onlookers who missed the day. He laments that evolution has been badly misunderstood over the last 150 years. For instance, “survival of the fittest.” This description is wrong and misrepresentational. Building has to be “win-win.” Coorperation is necessary for the world we live in. The ants’ civilisation is built on having shared genes. Our civilisations are built on having shared ideas. Human civilisation seems to have arisen five times independentally around the world, yet they are all very similar, which could be attributed to the hand of evolution by natural selection. Today, our interconnectedness (through the internet) is eroding the “in” group. o Think of yourself as a citizen of the world. o Think of global solutions that can be implemented locally. o Remember that the barriers are falling down. Wrapping up, he commented on the Fermi paradox – that is, why does there seem to be no evidence for other civilisations in the galaxy? To his mind there were two solutions to the paradox: the creation of the Global Voice is so traumatic that it is killed off at birth. Or that we are the first. Cristina is a video blogger who analyses questions of society with a rigorous logic and rationalism missing from many modern commentators. Cristina posed several reframing of problems and solutions to societal problems, such as gay marriage, legalisation of drugs and the legality of prostitution. Ayaan posed three predictions of the future world of 2021: one optimistic, one muddling through, the final a doom scenario. She espoused that we need to revive the values of the Enlightenment. We are too laid back with expressing our message, and we need to promote ideas with the same fervour as fundamentalist and extremist religious groups. Shane is a slam poet from Canada, and after his forty-five minute set I NEEDED his book. I have been rarely moved by poetry the way I was that day. Later, in the foyer to sign books, he wasn’t able to make it to the official area before a line spontaneously formed in front of him. Conference organisers then brought a table and chair to him. …was a brilliant speaker. He was the first for the day to actually use the whole stage, owning the space and drawing us into his world view. The thrust of his talk was on the “profound science illiteracy” and the effects of this on society in the United States, highlighted by catastrophic infrastructure failures such as the failing of New Orleans’ levee banks. Then, paying service to the original conference theme of Atheism, he spent some time looking at the statistic for religious people in the community. He revealed that 7% of “Elite Scientists” are religious, and suggested that if the Atheist evangelists (my term) of the audience were interested in changing people’s minds, then they should start on that 7%, and find out why they are of the opinion that they are. Question what the mechanism is. Our brains have a fallibility in that we look for patterns, and assume all patterns are real. For a first-off conference, I would imagine the organisers were very pleased with the outcome (even though Christopher Hitchens was unable to make his time.) Not only do I look forward to finding out the speakers for next year, but also am interested in the groups that will form before, during and afterwards for some more intellectual debating. Gabe unleashes his inner Lucas. It started on Tuesday morning when Gabe wondered how you got a LEGO man to move by itself. After devouring YouTube videos of other people’s LEGO Star Wars movies, my five year old son has been bursting to make his own. Together we made a ground of random flat LEGO boards. (We did have moon-scape LEGO boards, but as Gabe pointed out, “They don’t go to the moon in Star Wars, dad!”) Then we made a background wall with random blocks so that the dining room was blotted out. With the scenery made, I set up my netbook (running Ubuntu) in front so that frames of the movie could be captured by the computer’s built-in camera. Luckily for both of us, I gave up. I showed him how to take photos using the computer, then retired to my room with a coffee and a book. Some time later, he showed me his efforts. I know he is my son, and I’ll be impressed at anything he does. But, hell, I was IMPRESSED. There was a certain amount of figures appearing out of nowhere, but then there were the moments where one frame contained the cause and the next had the effect. Anakin’s lightsabre moved, and then the droid was on his back. The speederbike (unfortunately a bit out of frame) moved off around the back of the wall. He moved the camera for the scene of the trooper on the speederbike. All little pieces of evidence that he is beginning to understand the process of narrative and story telling. I collected these images, uploaded them onto my MacBook Pro, dumped them into iMovie, removed the (goddamned) Ken Burn effect, and had a rough movie. We played it a couple of times while Gabe worked out what he wanted to say, then I hit the voice-over button and let him riff. One minute (and one take) later, he had laid his voice and sound effects track. The finished product is magical. And most importantly, proof that the doing hasn’t driven out the desire, he is keen to make another one! In related news, his video has been blogged on Wired’s Geek Dad. With all this fame, I hope it doesn’t go to Gabe’s head and he ends up going over his old classic movie, rotoscoping out the dining room table, and digitally making the droids shoot first. Maybe the emotion of the scene is lost and one of the troopers should go “NOOOOOOOOOOOOO…” Hmmm.